For those of us who wonder about the, all be it slow, Crashing of the stock market and the growing interest in Fantasy Sports Gambling; Geomancy and its history might be a relevant point of entry into the exploration of the all too human desire to incorporate the expression of the random into a view of the future? ““A violent order is disorder; and a great disorder is an order. 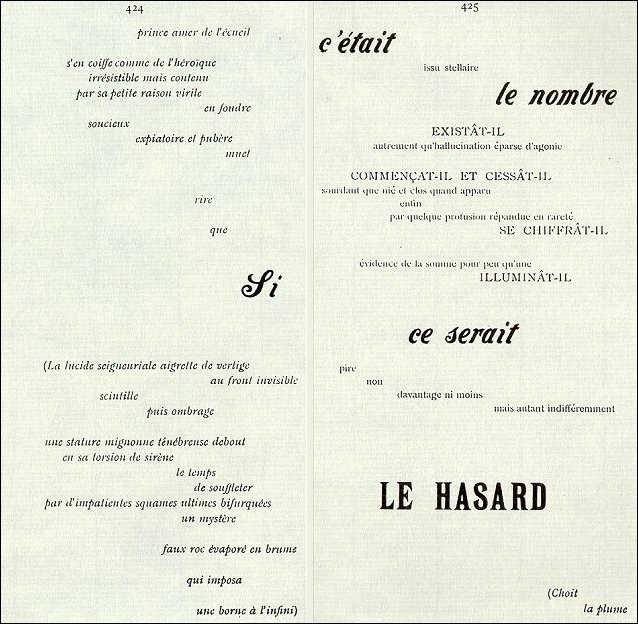 But before Stevens, Stéphane Mallarmé, and in particular his 1897 poem Un Coup de Dés Jamais N’Abolira le Hasard [“A throw of the dice never will abolish chance/hasard”] Explored in a completely poetic (and Hegelian) way the common problematic that locates confusion at the center of our media and sensory experience. Traditionally, geomancy requires a surface of sand and the hands or a stick, but can be done equally well with a wax tablet and stylus or a pen and paper; or even on your iPhone, online gambling, e-trading… the similarities are unavoidable…. ritualized objects may or may not be desired for use in divination. Often, when drawing marks or figures, geomancers will proceed from right to left as a tradition from geomancy’s Arabic origins, although this is by no means mandatory. Modern methods of geomancy include, in addition to the traditional ways, computerized random number generators or thrown objects; other methods including counting the eyes on potatoes…. Well, the book I am working with today gets deep into the technical “Scientific” aspects of the Method or Generation! It is a thick serious book full of plates and diagrams. 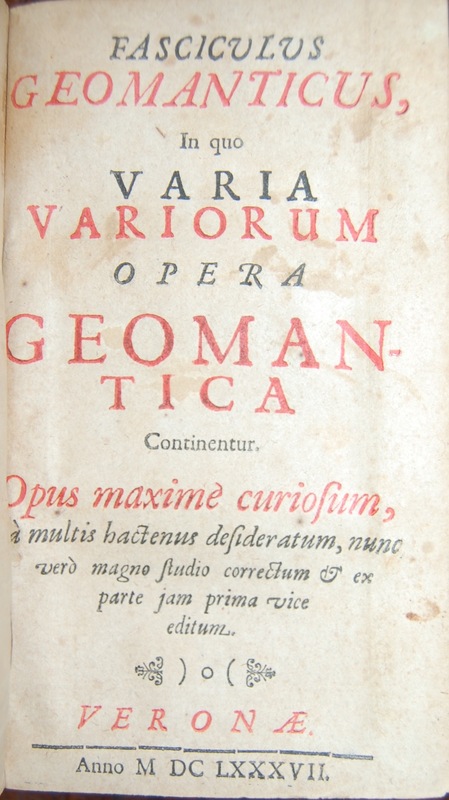 This compilation of Latin treatises on geomancy includes, among others, Robert Fludd’s Tractatus de geomantia, H. de Pisis’ Opus geomantiae completum in libros tres, and Quaestiones geomantiae Alfakini, here attributed to Platon de Tivoli but, according to Charmasson, based on the treatise of Gerard of Cremona ( (c. 1114–1187) was an Italian translator of scientific books from Arabic into Latin) . ” (Richard Fludd 1617, in Josten 1964). Josten, C.H. 1964. Robert Fludd’s Theory of Geomancy and His Experiences at Avignon in the Winter of 1601 to 1602. Journal of the Warburg and Courtauld Institutes 27: 327-335. 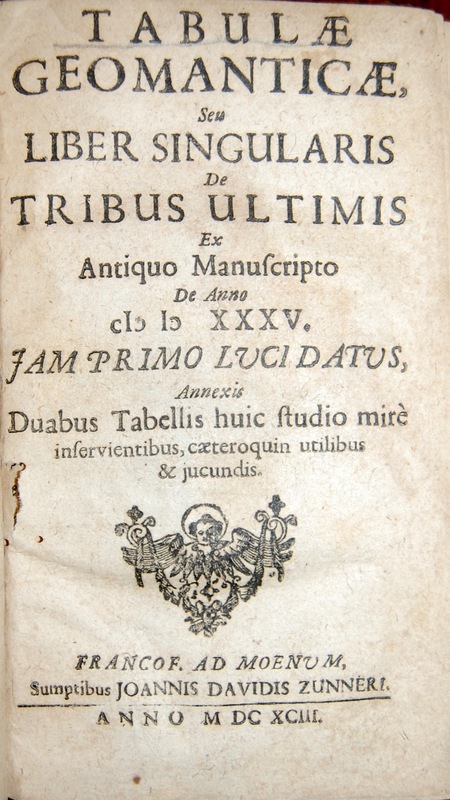 Tabulae geomanticae, seu, Liber singularis de tribus ultimis ex antiquo manuscripto de anno MDXXXV : iam primo lucidatus, annexis duabus tabellis huic studio mirè inservientibus, caeteroquin utilibus & incundis. Octavo 6 1/4 X 3 1/2 inches A-M8, N4 (N4 blank).II) A-Z8, Aa-Rr8,Ss4Page 123 is misnumbered here as in some copies of the first edition. II) first edition. Liber primus. De animae intellectualis scientia by Robert Fludd — Liber secundus. De praxis geomantica by H. de Pisis — Liber tertius. 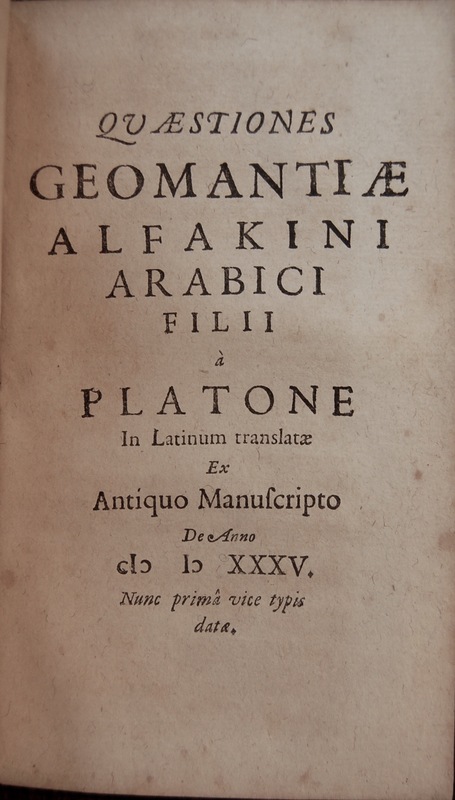 Quaestiones geomantica by Alfakini. These two works are frequently found together and in 1704 they were issued together. Geomancy, from Ancient Greek ge manteía translates literally to “foresight by earth”; it is a translation of the Arabic term ilm al-raml, or the “science of the sand”. Earlier Greek renditions of this word borrowed the word raml (“sand”) directly, rendering it as rhamplion or rabolion. Other Arabic names for geomancy include khatt al-raml and darb al-raml. Geomancy is thought to have established roots in the Middle East when returning Arabic merchants brought the esoteric knowledge from East Asia via the Silk Road. The original names of the figures were traditionally given in Arabic, excluding a Persian origin. The reference in Hermetic texts to the mythical um um al-Hindi potentially points to an Indian origin, although Skinner thinks this to be unlikely. Having an Islamic or Arabic origin is most likely, since the expansive trade routes of Arabian merchants would facilitate the exchange of culture and knowledge. European scholars and universities began to translate Arabic texts and treatises in the early Middle Ages, including those on geomancy. Isidore of Seville lists geomancy with other methods of divination including pyromancy, hydromancy, aeromancy, and necromancy without describing its application or methods; it could be that Isidore of Seville was listing methods of elemental scrying more than what is commonly known as geomancy. The poem Experimentarius attributed to Bernardus Silvestris, who wrote in the middle of the 12th century, was a verse translation of a work on astrological geomancy. One of the first discourses on geomancy translated into Latin was the Ars Geomantiae of Hugh of Santalla; by this point, geomancy must have been an established divination system in Arabic-speaking areas of Africa and the Middle East. Other translators, such as Gerard of Cremona, also produced new translations of geomancy that incorporated astrological elements and techniques that were, up until this point, ignored. From this point on, more European scholars studied and applied geomancy, writing many treatises in the process. Henry Cornelius Agrippa, Christopher Cattan, and John Heydon produced oft-cited and well-studied treatises on geomancy, along with other philosophers, occultists, and theologians until the 17th century, when interest in occultism and divination began to dwindle due to the rise of the Scientific Revolution and the Age of Reason. Thorndike, Vol. VIII, p. 481-482.; Caillet 4035. Having spent a fair amount of time leafing through this book, I am still amazed by the sustained effort that truly dedicated practitioners have spent on this seeming, to me, fatal effort: For those of you how have more endurance or might I say faith in this, this book offers more methodology that I can bare! Please explore it and enjoy! 6+11+16+21+21+31 = 111 and 36+29+22+15+8+1 = 111. Note here that both are sequential in their ordering. They should spell out the names of the magical names for the Spirit but they need to be put through the Hebrew alphabetical box for that. The one in the Pendle Heritage Museum also possess an array of constellation symbols and some names of Hebrew origin. Underneath the poorly transcribed sun symbol (which is now damaged) is the word, ‘Machen’. As J. Harland and T. T. Wilkinson pointed out – ‘Lancashire Folklore’ (1867), ‘Machen’ is the name of the fourth heaven in the ‘Heptameron’. What he does not draw attention to is that the names of Kedemel and Hagiel which appear alongside two of the constellation symbols are actually associated with the incorrect constellations. 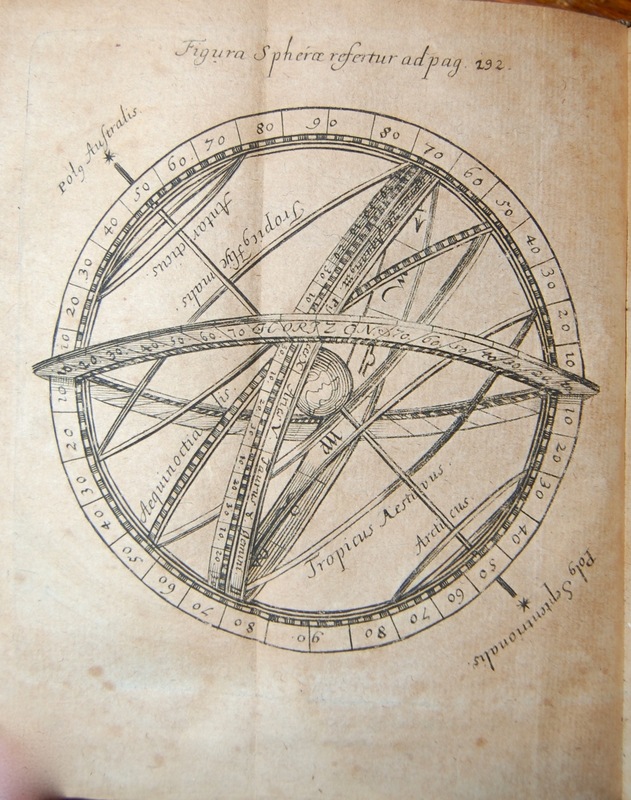 For Kedemel and Hagiel are associated with the planet Venus whereas the ‘Kedemel’ constellation symbol (as well as the geometric symbol on the far right of the page – the ‘neutral character’) should actually be associated with the Sun and (in the case of the former) labelled ‘Sorath’. Also in this segment is the name, Michael and a four part symbol of the Angel of the Lord’s Day (Sunday – ‘Sabbath’ in this context represents Saturday): Michael Dardiel Huralapal which, we are told, “ought to be called the four parts of the world”. The Heptameron was reputed to have been written by Peter de Abano. In actual fact, this is unlikely since he died in 1316 and this text seems to have been first published in the late 1500s although some of the symbols have undoubtedly been recycled from far earlier texts. In its first form this short grimoire was bound up with the Fourth Book of the ‘Occult Philosophy’ which in turn was reputed to have been written by Agrippa von Nettesheim and in its second publication (undated but very probably around 1600) the supplementary material included the other three books of the Occult Philosophy. 🙂 Indeed, a lot of sustained effort was going into this sort of thing – and it takes a lot to sort it back out again!!!! we can come up with something of note!!! Foulridge derives its name from two Anglo-Saxon words, fola (foal) and hyreg (ridge), suggesting that it was established by Angles, and took its name from the ridge where they grazed their foals – possibly at the modern day Pasture Head.